Spain's Rafa Nadal, who is widely considered to be the best clay-court specialist of all time, has equaled the record of Swedish tennis legend Bjorn Borg, claiming his 608th career win at the Barcelona Open Banc Sabadell today. Last year, Nadal lifted his record seventh Roland Garros titles to overcome Borg, who won the French Open on six occasions. With 608 career wins, Nadal shares the 19th rank with Borg in the all time list. The Spaniard to have clinched most wins in his career in Manuel Orantes with 635 victories. Former American World No. 1 Jimmy Connors leads the list with incredible 1,243 wins, followed by Ivan Lendl with 1,071 and Guillermo Vilas with 923. 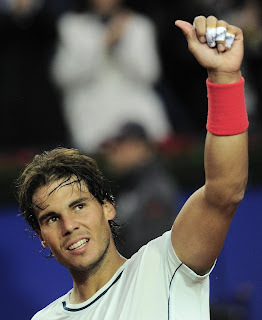 Nadal is the second ranked active player behind Roger Federer, who has clinched 891 victories. Winning the final in Barcelona, which would be his record eighth Barcelona title, Nadal will equal Yevgeny Kafelnikov with 609 victories.